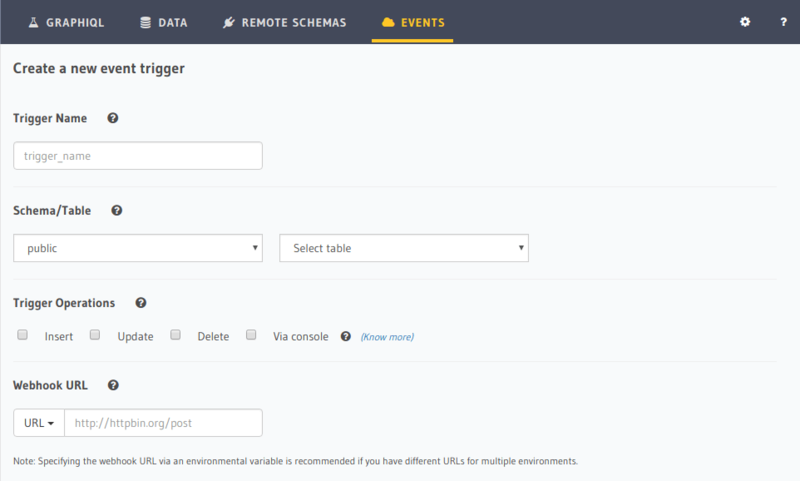 Event triggers can be created using the Hasura console. Unique name for event trigger. The postgres schema and table name on which event trigger needs to be created. The operation on which event trigger needs to be invoked. Can be INSERT, UPDATE and/or DELETE. The HTTP(s) URL which will be called with event payload on configured operation. Must be a POST handler. This URL can be entered manually or can be picked up from an environment variable (the environment variable needs to be set before using it for this configuration). Update operations are special because you may want to trigger webhook only if specific columns have changed in a row. Choose the columns here which you want the update operation to listen on. If a column is not selected here, then an update to that column will not trigger webhook. Retry configuration is available in the “Advanced settings” when you create a trigger. num_retries: This is the number of times a failed invocation is retried. The default value is 0.
interval_sec: The number of seconds after which a failed invocation for an event, is retried. The default value is 10. Custom headers can be added to an event trigger. Each webhook request will have these headers added. Key: Name of the header e.g. Authorization or X-My-Header. Type: One of static or from env variable. static means the value provided in the Value field is the raw value of the header. from env variable means the value provided in the Value field is the name of the environment variable in the GraphQL Engine which will be resolved before sending the header. Value: The value of the header. Either static value or name of an environment variable.